What about TEACHING and TEACHERS? It is what teachers think, what teachers do, and what teachers are at the level of the classroom that ultimately shapes the kind of learning that young people get. It’s a relatively self-evident truth that teaching and learning are two sides of the same coin. However, and as a growing body of evidence and research is demonstrating, most learning in the world takes place without any form of formal teaching. We all know there is a great deal of teaching taking place across classrooms (in every corner of the world) without much learning happening! So, is teaching important? What makes an “effective” teacher? Research on teacher effectiveness consistently shows that the formal education and learning of students is greatly dependent on the quality of teachers, the teaching they receive and the level of student engagement created by teachers. The “teacher effect”, as it goes, is higher than that of curriculum renewal, textbooks and materials, and (even) school leaders. In studies, for example, where students have been assigned to “ineffective teachers”, students have significantly lower achievement and learning than those assigned to “effective teachers” – TRUE but, WTH would even set up this type of study? So, what is an “effective teacher”? For many of us teaching is, in essence, about believing that all students can learn and doing anything and everything to help and encourage students to grow and develop as whole people. Teaching is about engagement and designing learning opportunities and environments that focus on what students can do with what they learn – and giving learners control, not trying to control learning. One of my favourite reads on this topic is Bain’s book “What the Best College Teachers Do” (which won the Virginia and Warren Stone Prize for outstanding book on education and society) and while a review of individual studies on teaching effectiveness reveals no commonly agreed definition of teacher effectiveness, Bain’s book provides an excellent conceptual model for what is it that makes a teacher “effective”. Bain’s work suggests that the most effective teaching is not a question of age or experience or expertise in a given discipline (although a sound knowledge of the subject-matter of a specific discipline is a given) but rather the result of a number of attitudes, conceptualisations and practices – these are typical of teachers who “take a learning perspective”. BUT, and this is where I throw LEARNING back into the ring, we said that teaching and learning are two sides of the same coin. 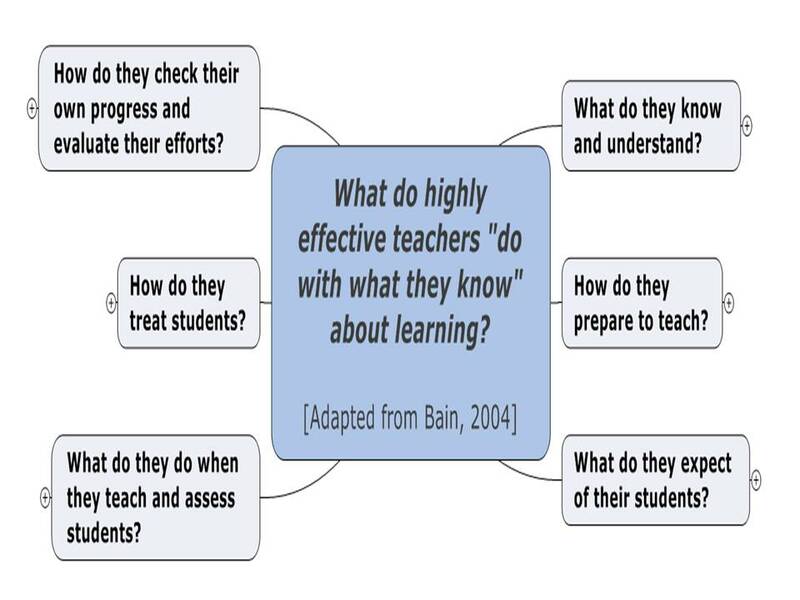 What do effective teachers know and understand about learning and teaching? What do they do with what they know and understand about learning and teaching? What do they do to improve what they do with what they know and understand about learning and teaching? That last one is a bit of a mouthful! Some different questions like these might help us really get to the heart of what makes a truly effective teacher. How would you answer these questions? A Three-day institute based on Ken Bain’s award-winning and best selling book What the Best College Teachers Do* (Harvard University Press, 2004), and featuring author Ken Bain from Montclair University and some of the subjects of the 15-year study of excellence in college education. Institute combines resources of Northwestern University, University of Texas, Rhode Island School of Design, and Vanderbilt University. What do the best teachers do to captivate and motivate students, to help them reach unusually high levels of accomplishment? Participants in this highly interactive institute will explore and use findings from a fifteen-year inquiry into the practices and insights of highly successful teachers, those people with phenomenal success in helping their students achieve remarkable learning results. The program will emphasize both improving one’s teaching and developing ways to share insights with colleagues back home. Enrollment is limited. The workshop will begin at 11 am on Wednesday, June 22, 2011, and end in the early afternoon on Friday, June 24, 2011, and will take place in the scenic suburbs of New York City, approximately 12 miles west of Manhattan. Enrollment Limited: Program has filled rapidly in past years. Early Bird Enrollment Deadline: April 1, 2011. Go to http://www.bestteachersinstitute.org/ for additional information and application form. Or call 973-847-9049 or write marshabain@optonline.net for additional information. taste is ideal, the articles is truly excellent : D.